Image: George Pimentel/Getty Images, Todd Williamson/Getty Images, Jamie McCarthy/Getty Images, Jason Merritt/Getty Images, Jeff Kravitz/FilmMagic/Getty Images, Jamie McCarthy/FilmMagic/Getty Images. Design: Allison Kahler/StyleCaster. Emma Watson made headlines in 2015 when she agreed to the Green Carpet Challenge, a promise that each of her red carpet looks from that year would be sustainable. Since then, many celebrities, including Lupita Nyong’o and Margot Robbie, have followed in Watson’s footsteps by wearing eco-friendly and promoting an ethical, sustainable future in fashion. And with Padma Lakshmi’s recent recycled look at the 2018 Emmys, it doesn’t look like the movement is slowing down anytime soon. 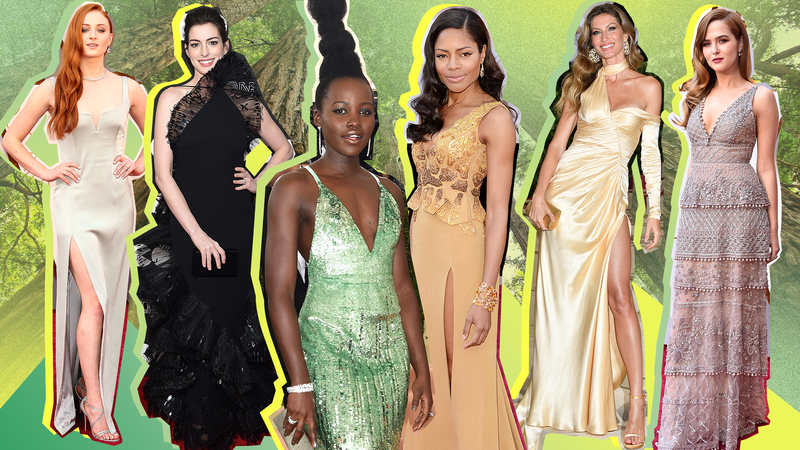 Ahead, we’ve collected the most beautiful eco-friendly looks celebrities have worn on the red carpet. From those made of plastic water bottles to those made of repurposed fabric, these looks are easy on the eyes and the environment. Watson is one of the most powerful voices in the sustainable-fashion movement. Each of the actor's looks from her Beauty and the Beast press tour in 2017 were made of eco-friendly materials. But Watson first made headlines for her eco-chic passion in 2016 when she attended the Met Gala in a Calvin Klein gown made from recycled water bottles. The look, which was worn as a part of the Green Carpet Challenge, included pants, a full skirt and an off-the-shoulder bodice. "That’s really the issue that we have with fashion, that people are buying clothes and throwing them away after wearing them twice, filling land[fills], creating unsafe working conditions. Destroying the planet, essentially.” Watson told Coveteur. For the 2013 Oscars, Harris took part in the Red Carpet Green Dress challenge by wearing a gown made of organic silk crepe de chine. The look was embroidered with recycled zippers, vintage glass beads and chocolate candy wrappers. The fabric was also dyed with goldenrod and chamomile — two substances that don't contain chemical pollutants. It was designed by Ghana-born fashion student Michael Badger (who was mentored by Vivienne Westwood) and was inspired by volcanos and flowing lava. Image: Stephane Cardinale - Corbis/Corbis via Getty Images. Blanchett made a statement at the 2018 Cannes Film Festival when she outfit-repeated her black Armani Privé gown. The actor, who wore the dress at the festival's arrivals dinner, recycled it from the 2014 Golden Globes to promote eco-friendly fashion. "From couture to T-shirts, landfills are filled with garments that have been unnecessarily discarded," she told The Hollywood Reporter. "Particularly in today’s climate, it seems willful and ridiculous that such beautiful garments are not cherished and reworn for a lifetime." Bündchen has long been an advocate for the environment, so it makes sense that she wore a sustainable dress to the 2018 Met Gala. The model, who has participated in the Green Carpet Challenge in the past, wore a gold Versace dress made with 100 percent Global Organic Textile Standard-certified organic silk and cotton. The dress was also free of toxic chemicals and was dyed ecologically. The zipper was also colorant-free and made of lead and nickel. 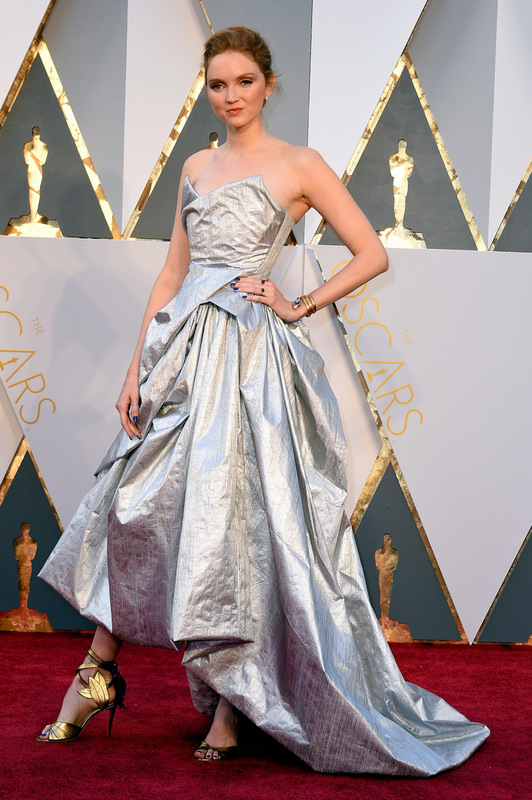 For the 2016 Oscars, Cole wore a silver Vivienne Westwood gown made completely out of recycled water bottles. "Leaving for the Oscars! Wearing a dress made of plastic bottles by Vivienne Westwood #rcgd," Cole wrote in the caption of an Instagram of herself in the dress. Her hashtag nods to Red Carpet Green Dress, another organization urging celebrities to dress sustainably. Nyong'o was one of three actors at the 2016 Met Gala to dress in eco-friendly Calvin Klein looks. The actor walked the red carpet in a sequin gown with velvet straps, which she wore as a part of the Green Carpet Challenge. Like Nyong'o and Watson, Robbie also participated in the Green Carpet Challenge in 2016. The actor wore a white Calvin Klein dress to the 2016 Met Gala with cutouts and zippers made from recycled plastic. The dress itself was made out of organic silk. Not only was Moore's black dress at the 2018 Cannes Film Festival sustainable, but so were her jewels. The actor, who wore the look at the Yomeddine premiere, wore ethical jewelry from Chopard. The jewels, including a necklace and rings, were from Chopard's Journey to Sustainable Luxury collection, which was created in collaboration with Eco-Age, an environmental organization founded by Livia Firth. “Simply wearing jewelry is a luxury,” Moore told Vogue Italia. "But knowing that the stones and the gold have been ethically sourced and mined makes the experience truly valuable." For the press tour of her film Colossal in 2017, Hathaway vowed to only wear sustainable looks. The actor kicked off her eco-friendly tour with a vintage Armani Privé from the brand's 2006 collection. Hathaway, who worked with celebrity stylist Penny Lovell for her eco-chic wardrobe, also wore a $20 dress purchased from the Rose Bowl Flea Market. Turner won over our hearts when she wore a sustainable dress to the 2016 Oscars. As a part of the Red Carpet Green Dress challenge, the actor wore a gray Galvan dress made of organic silk, which she styled with Tiffany & Co. jewelry, Christian Louboutin shoes and her signature red hair. Deutch turned heads at the 2018 Oscars when she wore a vintage Elie Saab dress with silver silk threads, sequins and vintage beads. The look was one of several dresses from that year to be a part of the Red Carpet Green Dress challenge.